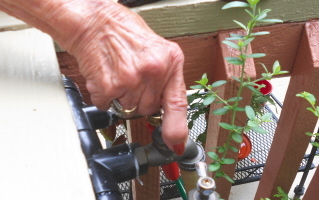 The boiler drain–An easier outdoor faucet for older gardeners – Johntheplantman's stories, musings, and gardening. 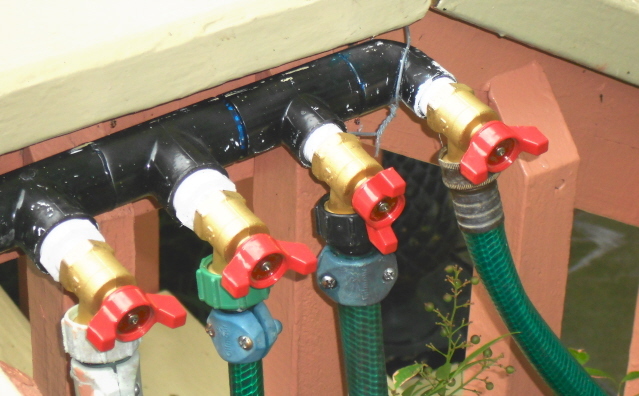 Micky was delighted with this system because she no longer had to walk through the shrubbery or switch hoses around. 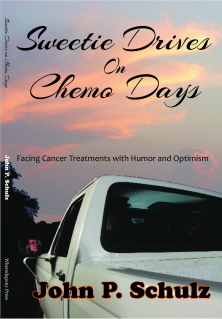 All she had to do was turn on a faucet. Problem solved? Nope. She called up this spring to tell me that one of the faucet handles had broken and when I showed up to see about fixing it, I noticed that she was having a hard time turning the water on. 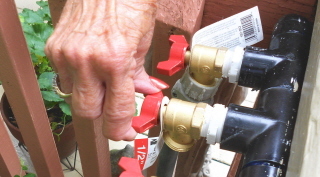 A hose bib works with compression, and she was having trouble turning the water on and off. I felt bad when I saw her struggling to turn the handles with her bent fingers. I found that she was once again having to use pliers to do the job. Another problem was that sometimes her yard man would leave the water running and she wouldn’t know it until there was a puddle in the yard. I went to the Home Depot plumbing department to find a solution. I believe in the “KISS” principle—“Keep it simple, stupid” and I searched for a solution that was simple, cost effective, and workable. I found it. 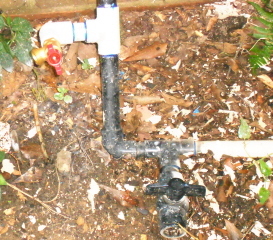 I decided to use a “boiler drain” which, as opposed to the hose bib which works on compression, works with a ball valve and operates with a simple quarter-turn of the handle. I worked the mechanism and decided that this would definitely do the trick. 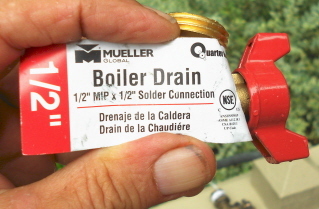 Here’s the boiler drain without the tag. 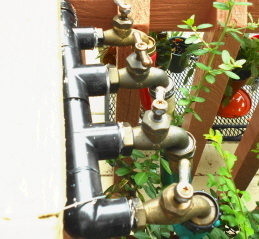 I removed the hose bibs and proceeded to replace them with the boiler drains. 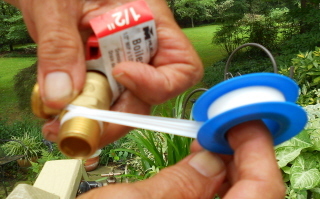 Teflon tape is applied to the threads to keep the joint from leaking. 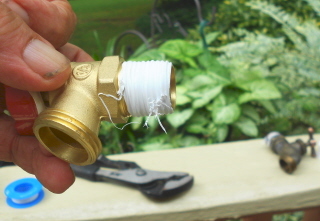 I always use teflon tape when threading any plumbing fitting. It really works. The boiler drains have been installed. One of the things we immediately noticed was that Micky could now see if any water was turned on by just looking at the faucet. The sideways handles are off and the vertical handle indicates that the water is on. Much better. Easy to work this faucet. One of the hoses is hooked up to a pistol grip nozzle for cleaning purposes. It works just fine and there’s no bending over or crawling through the bushes to turn it on. No dragging hoses, no bending over. Wow! And here’s a not too good picture of the faucet hookup. 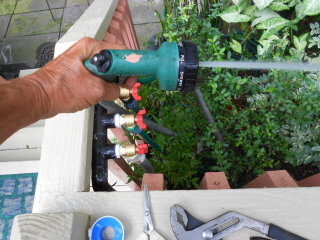 I installed a boiler drain for any necessary hose hookup. 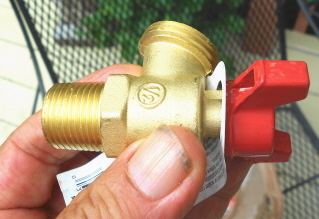 In the winter, all that needs doing is to turn off the wall mounted faucet and open the ball valve at the bottom of the line to drain the pipes. There’s at least one problem solved. 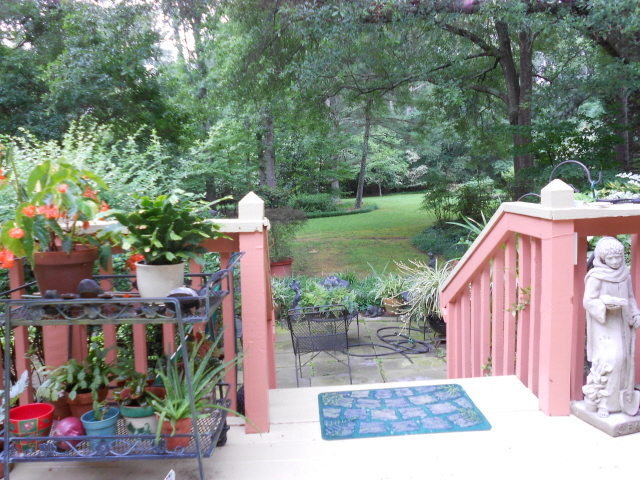 Can you think of any other things that need to be made easier for older gardeners? How wonderful and kind you are to help an elderly person to maintain her independence and to reap the joy of gardening!